Our animals have successfully been blessed for the year! It was fantastic seeing so many of our four-legged friends (and at least one no-legged friend) last Friday. We’ve got a jam-packed newsletter for you this week! Don’t forget, if you happen to meet the age requirement (21+), please feel encouraged to join us for our very dear friend Rev. Will Billow’s book reading this Friday (full invite and RSVP info below). As always, your agenda from today until the Great Reckoning is embedded below. Remember, you can always check the ESLA Agenda on this site by navigating to “My ESLA” > “ESLA Agenda” or simply plugging es-la.com/agenda into your navigation bar. Upper School Parent Coffee with the Head of School is this Thursday, October 11, at 7:45 a.m. Start your day right! Come knock back a couple hundred million piping hot cups of coffee and spend some QT with Interim Head of School, Peter McCormack, who will speak about his thoughts and plans for the year. Meet in the Cellar below the Gymnasium. 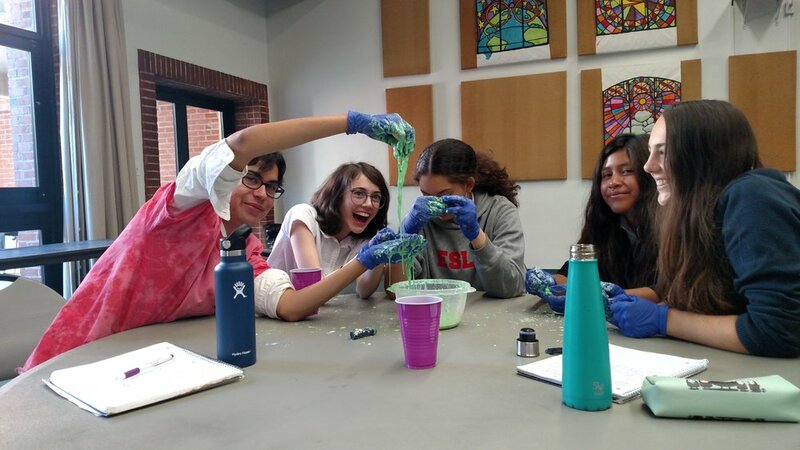 Chemistry students discuss the movement of molecules through different phases of matter and explore a non-Newtonian, Ooblekian fluid. Senior Asa B. (left) continues his year-long campaign to be included in as many newsletters as possible. For sophomores and juniors: You’ll be taking the PSATNMSQT this Wednesday morning. Get some sleep! Arrive on time and ready to go! Reminder! Our First Annual Battle of the Books is fast approaching! Co-hosted by Academic Council and the English Department! 1) If your student is planning to participate, please remind them they must register their team via Google Form (sent via email) by Friday, October 12. 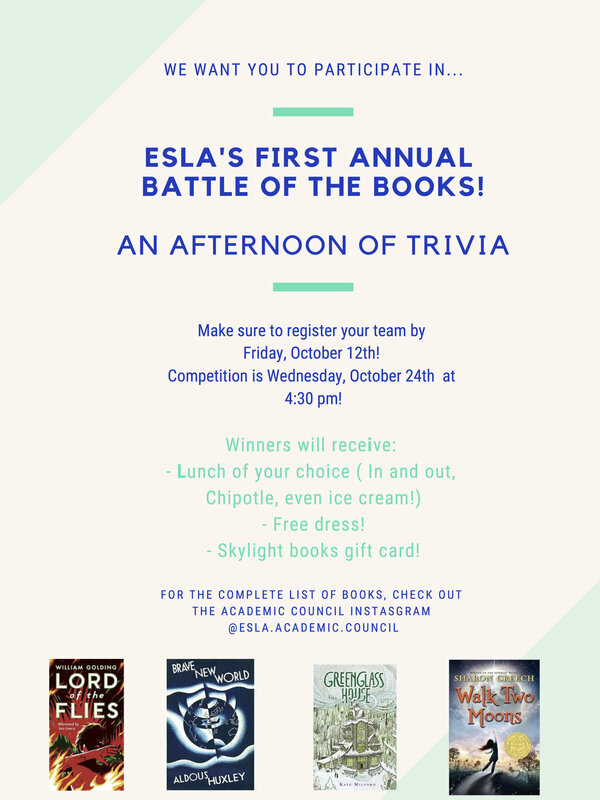 2) Battle of the Books will take place on Wednesday, October 24 at 4:30 p.m. We plan for the event to last approximately an hour with food served at the end. You can plan to pick up your student at 6:00 p.m.
3) Depending on the number of students planning to participate, we could likely use four or five parent volunteers to help serve pizza and drinks for our competitors. Please email foushee@es-la.com if you are interested in helping out. 4) Parents are welcome to attend. Students are going to be rotating through various classrooms to complete a series of trivia challenges. This Tuesday is the Five-Minute Play festival! Over the past three weeks, students in grades six through twelve have written, directed, and rehearsed five-minute plays. Students involved include: Joe Baldwin, Maya Bergman, Aria Nahm, Rex Rath, Malcolm Oehler, Paisin Kristen, Caroline LaDage, Chloe Hamori, Jacob Benoit, Sophia Grammer, Hagen Mohr, Sasha Nachmanoff, Mia Rodgers, Jacob Milder, Stella Walsh, Grace Hall, Fred Casildo, Henry Oehler, Sidney Abramson, Roman DeCorpo, Otis Bauer, and Ava Herlinger. Parents and friends attending the festival should park in the larger lot on Carlos and buzz in at the main western entrance on Gower. Please arrive early to park, check in at the front office, and find your way to the Mears Stage. Whodunit? Students continue rehearsal for Agatha Christie’s The Mousetrap. The coyote is a wild and intimidating creature, well known for eating rocks, shaving off all its fur, and doing like a million pushups just to freak out other predators in the region. In marginally related news, ESLA athletes continue to make their mark in competition. 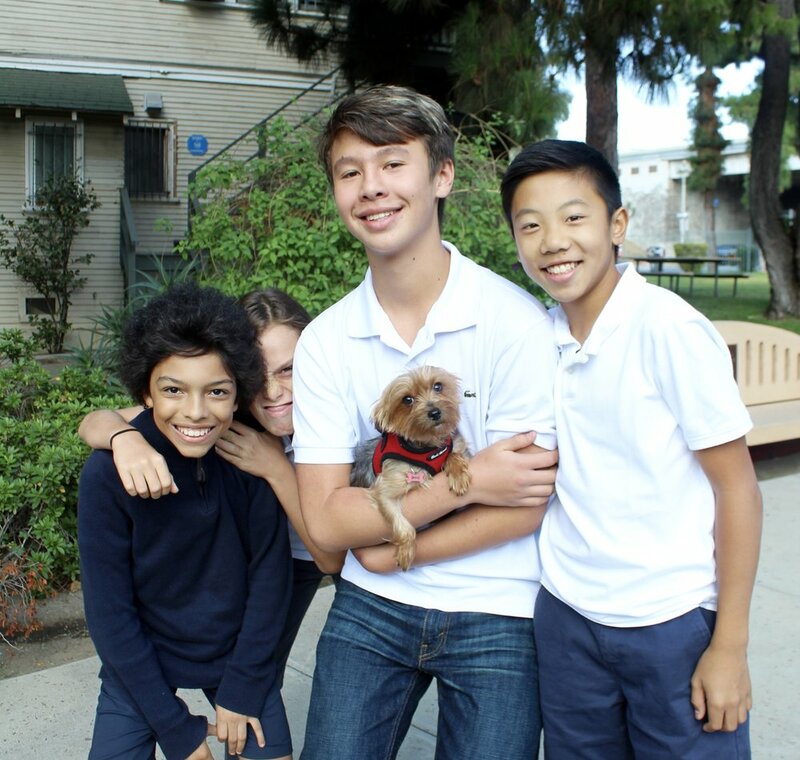 In Middle School, the cross country team continues to excel, and the girls volleyball team remains undefeated, securing a big win against Endeavor Prep last Friday! The Upper School Cross Country Team once again swept their heat at Elysian Park, and each ESLA runner attained a personal best time! The Upper School Volleyball Team opened the week with a big win and closed with a heartbreaking but exciting loss. Their season is winding down quickly, so try and catch them if you can. They play at Pan Pacific on October 8 and 15. Believe it or not, ESLA basketball players are starting to warm up in anticipation of their December 11 opener! Reminder! A very dear friend of ESLA, the Reverend Will Billow, has just published a book: Hatch, Match, and Dispatch. He’s journeying all the way to LA to conduct a reading and book signing for the ESLA community THIS FRIDAY, and everyone (age 21 and up) is invited! Incredible stories! Live music! Libations! You won’t want to miss it. This Friday, October 12, 5:00–7:00 p.m. The Three Clubs, 1123 Vine St.
Click here to RSVP for the event! Please direct inquiries to events@es-la.com. Our very own Hunter Perrin (music faculty), Jay Johnson (Head of Middle School), and Bill Bonk (ESLA parent), will be the opening act this Wednesday at the Viper Room, 8:00 p.m. Come catch some very fine folk, blues, and rock ‘n’ roll from our faculty and friends, then stick around for some crazy Swedish metal if that’s your thing! Tickets are here! Must be 21+ to attend.